A special diet in the family can make meal planning a challenge. Here are some techniques to help you simplify. Chances are you know someone (or are someone) with a special diet. It may be a peanut allergy or a desire to curb calories or something altogether different, but special diets are becoming more and more prevalent. 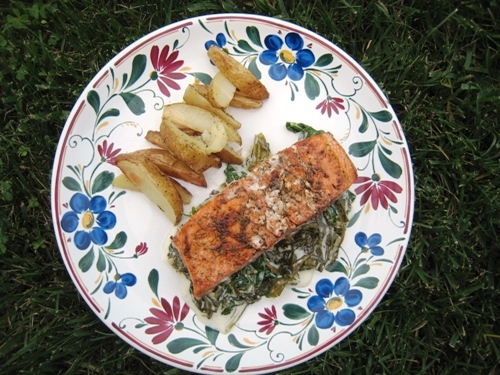 Meal planning for a special diet can be tricky for the home cook. Some families choose to change everyone’s diet in order to make it easier on everyone. Others make adaptations as needed. But, on the cooking front? It’s wearing me out to make two meals, even if one of them is a freezer meal. I’m leaning on some different strategies for the coming weeks to blend my special diet in with the rest of the family’s and make this transition to a different way of eating just a little easier. 1. Focus on what you can have. It can be really hard to all of a sudden omit certain foods from your diet. I’ve had friends who’ve had to completely eliminate gluten or sugar from their diets. Even when my husband and I were simply cutting our calorie intake last summer, it was necessary to avoid certain foods simply due to their utter lack of nutrition or our temptation to overindulge. It can be quite depressing if you focus on what you can’t eat. But, if you turn your attention to the favorite foods that are still permissible, the experience can take on a different complexion. While not “easy”, it can be pleasant. 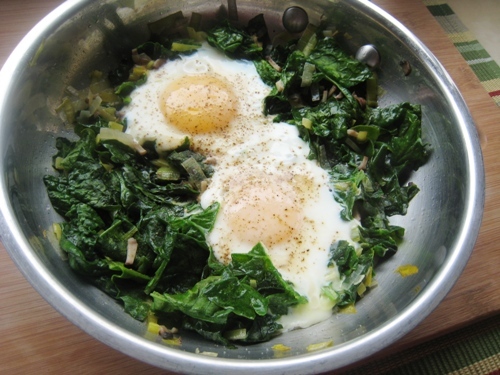 Skillet-Poached Eggs with Greens are one of my very favorite breakfasts. While they are over the top good with hashbrowns and a slice of buttered toast, they are just fine on their own. More than fine. They are downright awesome. Sure, I might get sick of them by the end of the month, but for now, I’m thrilled to enjoy them to my heart’s content. 2. Find foods in common. I’m the only one in our family eating a Paleo-type diet; I don’t know enough about it or its benefits to make wide-spread changes for our family. But, there are plenty of overlapping foods in my diet and my family’s. This week I’m focusing on lean meats and fresh produce for our family meals. My family can have the addition of breads, grains, and cheese. I will make up the difference with healthy fats like avocado and nuts. I can still make fajitas or tacos, I will just have mine in lettuce or cabbage leaves instead. Don’t knock it, it’s super tasty. Last week on Life as MOM I shared a free printable meal plan and grocery list that suits a gluten- or dairy-free diet as well as those that eat everything. Download the meal plan here. Yes, there are some recipes included that wouldn’t be appropriate for gf or df (like the dessert), but that is noted on the plan. Head here to see a full list of paleo-friendly (ie gluten and dairy free) recipes from Life as MOM, Good Cheap Eats, and Not Your Mother’s Make-Ahead and Freeze Cookbook. Some may need slight adaptations, but those adaptations would be obvious. 3. Allow for a special treat. Whether it’s a child with a peanut allergy or a mom trying to watch what she eats, I think it’s important to allow for a special treat for everyone. My kids have enjoyed ice cream while I abstained. But, they understand why my Larabars are off limits. Until I make my own, there just isn’t the funds to buy $1 fruit bars for the masses. Whenever possible though, I’m happy to share a bowl of Monkey Salad, my new favorite treat. Recipe coming tomorrow. When the kids get candy gifts that contain peanuts, after they’ve been instructed to wash their hands really well, we make sure that we have something special to offer my daughter who can’t have peanuts. I know several moms who bake and freeze gluten-free cupcakes so that their children can enjoy a sweet treat when they go to birthday parties or other festive events. There are plenty of ways to provide for “treats” on any diet. 4. Make changes that suit everyone. We don’t allow peanuts in the house if we can help it. I have not purchased a peanut product in over two years. It’s just not worth the risk. So, we buy sunbutter instead. All my children prefer it now to peanut or almond butters. The change suits everyone and protects my daughter’s health. In some cases it’s not economically feasible to switch everyone to a certain diet. However, if there are simple changes that can be made globally, it’s easier on everyone concerned. Unless yours is a raw diet, I don’t see how freezer cooking can’t fit into any diet. 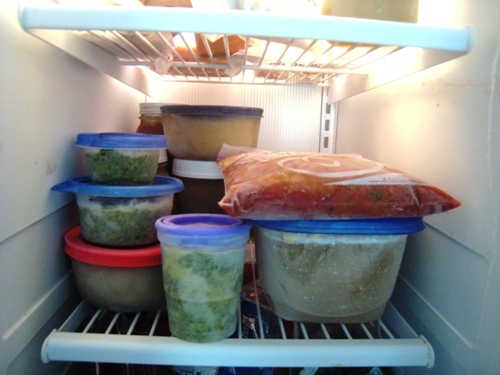 There is always a way to pre-prep and freeze any number of items. Even currently when I’m eating lots and lots of fresh veg, I’m digging into my freezer for the sliced and frozen bell peppers that I “put up” a few months ago. This has been such a game changer! Pulling pre-cut vegetables from the freezer has made stir-fries so much easier and quicker to pull together. There is a wealth of freezer cooking options available for any diet. I’ll be talking about that in next month’s Freezer Cooking Days. 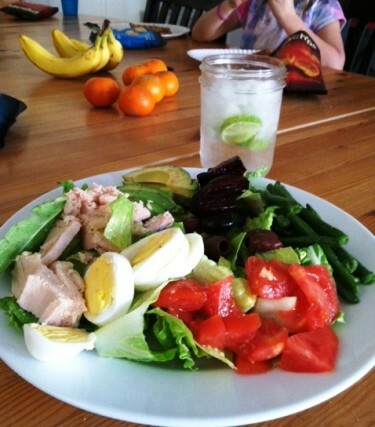 Adjusting to a new diet, whether your own or a family member’s, is hard work. There’s a new learning curve, new price points to consider, and a whole new way of viewing the kitchen. Be willing to cut yourself some slack in one area until you get into a groove. When hubby and I started counting calories, we realized how bad some of our favorite restaurants were. While they were cheaper than others, we still crossed them off the list since they weren’t good for us. We chose a more expensive option if it easily fit into our new diet goals. This month I’ll go over our grocery budget a bit in order to accommodate this diet. I realize it’s a great blessing to have extra cash to be able to do this, to even choose what I’ll have at my next meal. However, I am choosing not to stress about the extra cost because this a pretty complicated undertaking. Plus, I want some sugar! Let down your bargain-shopper guard, buy pre-cut, frozen vegetables, or otherwise ease up on yourself in some area. You’ll feel better, and your new eating plan will have a better chance to succeed. Check out Menu Plan Monday for even more meal planning ideas. Not exactly on topic, but hear hear! for the pre-chopped, frozen bell peppers. That was the best choice I ever made. I like to keep a fresh one or two for salads, but for regular meals, the container of frozen ones is awesome. @Sandi, it really is making meal times easier. I’ve been making mostly gluten free meals for years.. most of the time, I’ll just add egg noodles or something similar for M’honey. It makes life a whole lot easier. I used to make meatballs and meatloaf with crushed up pork rinds.. Flavor-wise, you cant taste them but its not as fluffy as using bread or crackers.. but still.. it works. Amen to giving yourself a break now and then! I’m dealing with pregnancy nausea, so meals are NOT as fancy and drawn-out as they were a while ago. The crock pot is doing a lot of cooking for me these days! I decided to splurge on convenience items this week, too, because nothing in the house sounds remotely appetizing. And a girl has to eat something, even if it is fruit cups and popsicles all day! Hey Jessica, I know my local Wal-Mart sells a bacon you might be interested in. Hormel Natural Choice, has no nitrates/nitrites. Not as expensive as health store bacon which runs about $6-$8. Oscar Meyer has one without nitrates/nitrites too, but I’ve only been able to find it once. But, I also live in a small town, not a larger city as you do, so you might find these options at places you already shop. @NIA, Oh, wait you’re eliminating sugar, and hormel has turbinado. Oscar has cane syrup. That’s why my bacon tastes so good, cause of the sugar. I shouldn’t be shocked, but I can’t believe they’re putting sugar in my meat. Now I’m feeling like the girl who knew too much. I’ve seen youtube videos of people making their own bacon and I’m wondering if that’s what I’ll have to resort to?! Just unbelievable. Thanks for opening my eyes even wider to the realities of what I feed my family, while thinking we eat pretty healthy! @NIA, yep, you beat me to the answer. This has been a hugely eye-opening experience for me. I thought we were eating very healthfully. But, I’m reconsidering that assessment. cheese made from cashews! 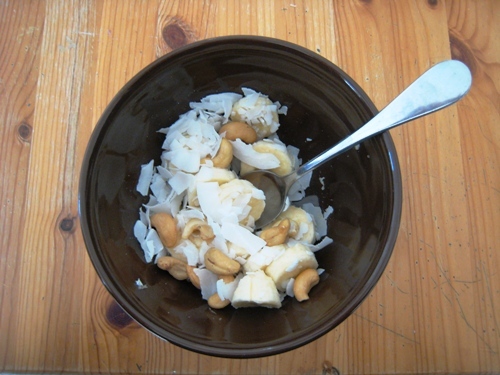 Seeing all the cashews you have been eating reminded me of this recipe. I don’t know all the ins-n-outs of your diet, so I’m not sure if the method of preparation is allowed in your diet. @Leah, well, that was interesting! LOL. The Whole 30 actually says not to mimic your “illegal” favorites since it might trigger cravings. Here’s hoping that dairy is not my problem and I won’t be tempted to make cashew cheese. Oh my! If you freeze a banana and then put it in your food processor for a few minutes, it will have the consistency of ice cream and believe it taste like ice cream. I think it is called a “banana whip.” You could add cocoa powder to make it chocolate or add strawberries. Also I have seen Paleo recipes for “ice cream” using coconut milk and no sugar. @Christine, I am planning to detox my children from sugar in a few weeks, so I will definitely try that. Thanks for the reminder. Isn’t that the truth? Good luck with that. I’ve done stir-fries, spaghetti with squash noodles, etc., but…I agree that it IS hard!! I can’t stand making two or more meals (mine and theirs), so I need to get my recipes/menu right the first time. I desperately need to heal my own body and do something like Whole30, but with virtually no willpower to assuage sugar/bread/peanut butter cravings, I must include my family in on this. Besides, we have too much (potential) ADHD, auditory processing, aches and pains, and behavioral issues going on for me to be lazy about biting the bullet and making my whole family bite it, too. So that brings me to feeding young ones: how to sustain a young kids’ growing body (6 – 9) and the issue of “getting them” to eat a lot of new things. The Whole30 menu you followed looks delicious, but not exactly doable for 5. [Do I really need to eliminate things such as lentils and beans? I know, I know. It’s only 30 days and supposedly you can do most things for 30 days (and the last 30 before school starts, so really we had better figure out sensitivities NOW, right? ); however, I am usually the one who can’t do anything past 4 before I give in.] What are the best resources without breaking a very skinny bank? 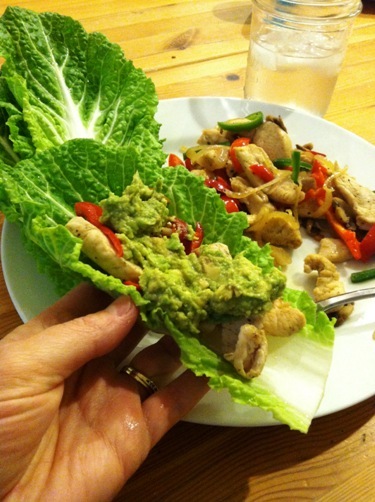 I’m looking at books online–It Starts With Food and Well-Fed: Paleo Recipes. Any thoughts? Links? Free-menu planning? Kid-friendly ideas? P.S. My son has been known to eat 3 burgers in one sitting, so I’ve been anxious that without the simple starches my kids will be in the kitchen non-stop! You ask some great questions. I know how hard it is to fill kids up without the starch, that’s why I did it on my own. There were a few meals that everyone could eat, but not a ton. The kids are used to their pasta and rice. So are husbands. 🙂 I read It Starts with Food. But, I’m really interested to read Gwyneth Paltrow’s book on clean eating, It’s All Good.